The technology industry, in lobbying Congress for expansion of programs to attract skilled foreign workers, has long claimed that foreign students graduating from U.S. universities in science, technology, engineering, and mathematics are typically “the best and the brightest,” i.e., exceptionally talented innovators in their fields. However, the industry and its supporters have offered little or no evidence to back up their assertion. The claim is investigated in this report, with a focus on former foreign students now working in the United States, the group viewed by the industry as key to innovation. The famous David Halberstam phrase, “the best and the brightest,” has been used in many contexts, but perhaps none more than to describe the foreign-national engineers and programmers we are told the United States desperately needs in order to compete in the global economy. The debate involves the H-1B visa (which allows U.S. employers to temporarily hire foreign workers possessing at least a bachelor’s degree), employer-sponsored green cards (which grant permanent residency status), and other related facets of U.S. immigration policy. Recently the discussion has centered on proposals to grant automatic green cards to international students who earn advanced STEM (science, technology, engineering, and math) degrees at U.S. universities. This latter group will be the major focus of this report, which analyzes data on former foreign students who are now working in the United States. Some are still on temporary work visas, while others have been granted U.S. permanent resident or naturalized citizen status. “…[restrictive U.S. immigration policy is] driving away the world’s best and brightest”—Microsoft Chairman Bill Gates (Barlas 2008). “We should not [send our] bright and talented international students…to work for our competitors abroad upon graduation”—National Association of Foreign Student Advisers (NAFSA 2007). “…We should be stapling a green card to the diploma of any foreign student who earns an advanced degree at any U.S. university….The world’s best brains are on sale. Let’s buy more!”—New York Times columnist Tom Friedman (Friedman 2009). “I personally don’t think you can have too many geniuses in America”—Rep. Zoe Lofgren, 1999, speaking in support of automatic green cards (McCullagh 1999). Though the United States should indeed welcome the immigration of “the world’s best brains,” are the foreign students typically of that caliber? The tech industry has put forth little to support such assertions. It has pointed to some famous immigrant success stories in the field but, in most cases, the people cited, such as Google cofounder Sergey Brin, never held foreign-student (F-1) or work (H-1B) visas (Brin immigrated with his parents to the United States at age 6). And more importantly, neither the industry nor any other participant in this national debate has offered any empirical analysis documenting that the visa holders are of exceptionally high talent. This report aims to remedy this lack of data. With an eye toward the green card proposals, it will focus mainly on those who first entered the United States as foreign students in computer science or electrical engineering (CS/EE)—the two fields that make up the bulk of the H-1Bs.1 It will also look at foreign tech workers in general. The study finds that the tech industry’s “genius” claims for these groups are not supported by the available data. Compared to Americans of the same education and age, the former foreign students turn out to be weaker than, or at most comparable to, the Americans in terms of salary, patent applications, Ph.D. dissertation awards, and quality of the doctoral program in which they studied. For some readers of this report, perhaps the most surprising result here will concern work in research and development (R&D). The industry has emphasized that it needs foreign workers in order to keep its innovative edge over other countries, yet the data show that the former foreign students are significantly less likely to work in R&D than the Americans. In other words, H-1B and related programs are not raising U.S. levels of talent and innovation in the tech fields, and are in some ways reducing them. These results are for the industry as a whole. There is a perception, however, among some in Congress and by some academics that Indian and Indian-American outsourcing firms operating in the United States abuse the H-1B visa, while mainstream American firms use the visa to hire outstanding talent (Cha 2010).2 Yet the analysis here effectively excludes the outsourcing firms, so the report’s findings of a lack of a best/brightest trend apply to the mainstream firms. Thus, the first (and main) part of this report will demonstrate that Rep. Lofgren’s “can’t have enough geniuses” remark was unwarranted hyperbole. But what about a slightly modified version of Lofgren’s statement: Isn’t it good to have as many engineers as possible, even if they aren’t geniuses? The answer is no, because the H-1B and green card programs have been causing an internal brain drain of tech talent in the United States. As will be shown here, these programs squeeze out U.S. citizens and permanent residents from the field and make the field unattractive to this country’s most talented young domestic students. The second part of this report will cover this urgent issue. Given that the foreign students are not producing a net gain in talent level, the internal brain drain suggests that the foreign-tech-worker programs should be reduced in scope, not expanded. Proposals for reform are presented in the third and final part of this report. “U.S. companies face a severe shortfall of skilled scientists and engineers…[needed to] develop the next generation of breakthroughs” (Gates 2008). “By proposing a simple change in immigration policy, EU politicians served notice that they are serious about competing with the United States and Asia to attract the world’s top talent to live, work, and innovate in Europe…” (Barrett 2007). “…America is expected to run out of its 2008 allotment of temporary (H-1B) visas for highly educated professionals in April—before these future innovators even graduate….It’s time for Congress to reform our temporary and permanent visa programs for highly skilled professionals for one simple reason: to secure America’s innovative position in the global economy” (Hoffman 2007). “Innovation requires innovators.…By modestly increasing green card numbers…Congress would ensure [America’s] place as the world’s innovation leader” (Texas Instruments 2011). “These are real game-changing players” (Kroll 2011). The message is abundantly clear: What the tech industry values are innovators, the “game changers.” Let us accordingly take as our definition of best and brightest an exceptional level of innovative or creative talent. How should we quantify best/brightest? All of these measures should reflect the innovative abilities prized by the tech industry. Instead of combining all immigrants, or all foreign workers, this report will focus mainly on immigrants who first entered the United States as foreign students. Instead of combining workers from all fields, this report will focus on those who have degrees in computer science (CS) or electrical engineering (EE) and who are working in those fields. The CS and EE fields are of interest as they are the two most common among foreign STEM workers, and there is broad overlap between the two fields. Many EE graduates, for example, work as software developers. University CS departments often have faculty with EE degrees and vice versa. This restriction to field is key, as there are many pitfalls in these kinds of data. Take the field of mathematics, for instance, at a company like Google. Some mathematicians might work there as data miners, at a high salary, while others may work as analysts of server reliability, at a lesser salary. Yet to the unwary researcher, both types of mathematicians would be treated as one. As a CS professor (formerly a professor of electrical and computer engineering) and a former Silicon Valley software developer, the author understands the qualitative side of the CS/EE labor market, and thus limits this analysis to it. Unlike Hunt (2011), this report will not analyze entrepreneurship and number of research papers published, as the value of each of these indicators in assessing innovation is problematic. The difficulty with focusing on entrepreneurship is that one doesn’t know what kind of business is involved. Berkeley researcher AnnaLee Saxenian found that 36 percent of the Chinese-immigrant-owned firms were in the business of “computer wholesaling,” meaning that they simply assembled commodity PCs, with no engineering or programming work involved (Saxenian 1999). This business certainly does not represent best/brightest innovation. And many Indian-owned tech firms are in the outsourcing business—again not the type of entrepreneurship that is relevant here. As for counts of research papers, the consensus in academia is that such counts confuse quantity with quality, and thus offer a poor measure of skill (Patterson, Snyder, and Ullman 1999; Hamermesh and Pfann 2011).3 In addition, publication rates vary widely among research specialties, so that, for example, CS researchers in software publish much more frequently than CS researchers in algorithms. It is thus highly difficult to connect publication counts to innovation. the Association for Computing Machinery (ACM) Dissertation Awards. The PERM data consist of all employer-sponsored green card applications, 2001–2011, for further salary analyses. We use the remaining datasets to analyze the former foreign students in terms of dissertation awards and quality of graduate institution. In using salary analysis to assess innovative ability, one must deal with the issue of possible underpayment of visa workers. The industry has vehemently denied underpaying H-1B workers. Indeed, the question as to whether holders of the H-1B work visa are paid less than comparable Americans has been the subject of controversy even in the research literature. The law requires employers of H-1Bs and green card sponsorees to pay the prevailing wage, defined as the average salary in a given occupation, for a given region and a specified number of years of experience. The industry’s denials of underpayment are technically correct; violations of the law are rare, even among Indian outsourcing firms. However, loopholes enable underpayment of the foreign workers relative to their true market value. For example, the government data do not account for special technical skill sets, or for having an advanced degree. On the other hand, Lofstrom and Hayes (2012) concluded that the H-1Bs are at least as well paid as the Americans, and Mithas and Lucas (2010) found that foreign information technology (IT) workers are paid 2.3 percent more. A key aspect of these studies is the dataset. Mithas and Lucas, for example, based their analysis on a reader survey of a magazine for IT managers, not mainstream engineers and programmers. Also, the average age in their sample was about a decade older than among H-1Bs in general, thus again indicating that their study may not be representative of the mainstream. Though Hunt (2009; 2011) corrects for field of highest degree (but not current profession), her dataset is extremely broad, with unknown consequences to the analyses. Another issue is that, in attempting to determine whether H-1Bs are paid less than comparable Americans, the key word is comparable. The industry claims that typically H-1Bs are hired because they possess special technological skills that are in short supply among Americans. For example, experience with Android programming reportedly commands a premium of 20 percent in the open market for software developers (Drapier 2011). Matloff (2003) found skills premiums ranging from 16 to 24 percent. So, ideally statistical analyses should include a variable for experience with “hot” skills. Yet such data are not available for individual workers, and if, say, Android programmers are disproportionately foreign, as the industry claims, the analysis would misleadingly make the foreign workers appear to be doing well relative to the Americans. This seems to be a core problem with the Lofstrom and Hayes study, for example. The consequences of failing to take skill sets into account are that (1) studies that find that H-1Bs are exploited in wages will underestimate the degree of underpayment, and (2) studies that find no exploitation can be misleading. In the latter case, suppose a study finds that on average H-1Bs make 5 percent more than Americans. If the special skills for which H-1Bs are hired command a 20 percent premium on the open market, then they are being underpaid by roughly 15 percent, all in full compliance with the law. In any event, the evidence supporting the finding of wage exploitation of H-1B visa holders is consistent with what economic theory would predict: that the H-1Bs are underpaid relative to Americans of comparable education, skills, and so on, due to lack of mobility. That is, if one is not a full free agent in the labor market, which is effectively the case for H-1Bs who are being sponsored for green cards (NRC 2001; Swaim 2012b; Matloff 2003), one will on average not get the best salary deal. Furthermore, since green cards provide highly valuable nonmonetary compensation, the sponsorees will generally accept pay lower than their free market value. The present report is not aimed at furthering the debate on the underpayment of H-1Bs, but the issue is relevant to our salary analyses here. For the NSCG data, this problem is solved by limiting the analysis of former foreign students to those who are now U.S. citizens and permanent residents, thus no longer exploitable. The case of the PERM data is more complex, to be discussed later. We are thus comparing U.S. natives to former foreign students now working in the United States. For simplicity, this report will refer to the U.S. natives as “Americans,” but it must be noted that many of the former students are naturalized and are now Americans too. Note also who is excluded. First, the analyses only include those who entered the United States on a foreign student visa—excluding those who entered on a work visa—as explained in the methodology section above. Also excluded are those who immigrated under family qualifications and the like. Some researchers have found U.S. education to be an important variable, which may play a role in the American cultural propensity for innovation. If so, then how much U.S. education is “enough”? The easiest solution is to restrict the analyses to those born in the United States. As noted earlier, the analyses here effectively exclude Indian/Indian-American outsourcing firms because these firms import workers directly from abroad, rather than from U.S. university campuses, the pool considered here. And the PERM data consist almost entirely of U.S. mainstream firms, as the outsourcing companies rarely sponsor their workers for green cards (Hira 2010). There are control variables for age; for education, in the form of indicator variables to code a master’s degree (without a Ph.D.) or a doctorate (zero values for these variables code having just a bachelor’s degree); for working in a high-cost-of-living region; for having originally entered the United States as a foreign student; and for working in academia or in government. For example, the subpopulation of former foreign students is paid on average β6 more—or less, if this quantity is negative—than Americans of the same age, educational attainment, and so on. A quadratic term is included for age, as wages decline for engineers and programmers (and other workers) after about age 50. Since the foreign workers tend to work in the higher-cost-of-living areas, the highCOL variable is important to adjust for work in such a region, which is defined here (using NSCG’s categories) to be Mid-Atlantic, New England, or Pacific Coast.5 In addition, there are indicator variables for working in academia and in government, to account for the generally lower salaries in those sectors. 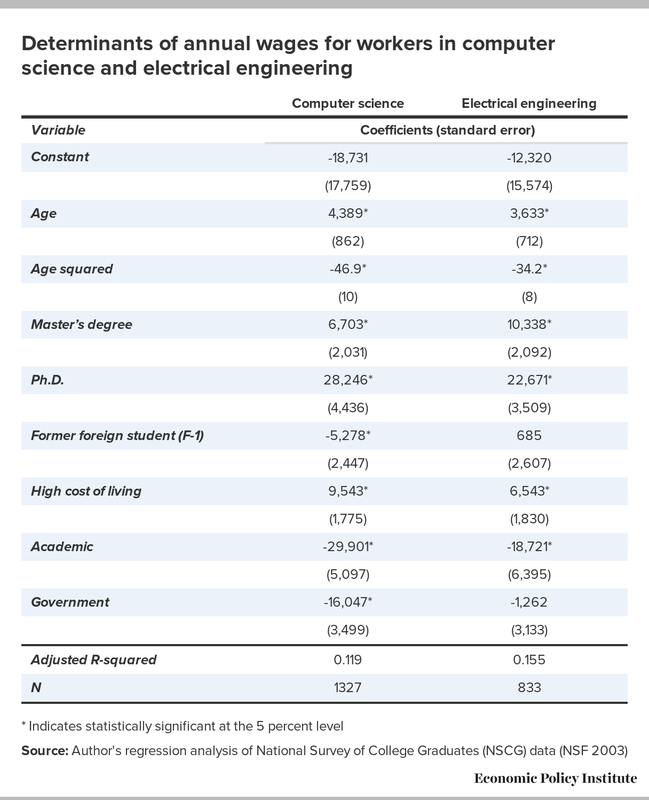 Table 1 presents the estimated coefficients for computer science and electrical engineering, along with standard errors. Rather than merely reporting the results of statistical significance tests, standard errors are also reported. Adding and subtracting 1.96 times the standard error to the point estimate yields a 95 percent confidence interval for the population quantity being estimated. In this case the table shows the point estimate and standard error to be -5,278 and 2,447, showing that we are 95 percent confident that the former foreign students working in CS make between $383 and $10,172 less than comparable Americans. Use of standard errors, i.e., confidence intervals, rather than significance tests yields more informative results (Freedman, Purves, and Pisani 1998; Kaye and Freedman 2000). The adjusted R-squared value was 0.119.7 This somewhat low value, common in labor studies, reflects the fact that there is great variation in individual talent levels in the CS/EE field, even after education is accounted for. The best software developers, for instance, have been found to be 10 or even 20 times more productive than the weakest ones (DeMarco and Lister 1987; Lutz 1999). The regression results for electrical engineering (EE) are presented in Table 1 as well. Former foreign students working in EE earn no less but no more than U.S. natives, as the coefficient is not significantly different from zero. We thus see that no best and brightest trend was found for the former foreign students in either computer science or electrical engineering. On the contrary, in the CS case the former foreign students appear to be somewhat less talented on average, as indicated by their lower wages, than the Americans. The Department of Labor’s Program Electronic Review Management data consist of records of employer-sponsored green card applications. Each record corresponds to one sponsored worker.8 The 2005–2011 data used here9 include 32,005 applicants with software engineer titles and 3,412 electrical engineers. In the data, the employer states the wage paid and the legal prevailing wage for the job, the latter typically defined according to government data.10 Note that unlike the other analyses in this paper, the workers in this dataset are not restricted to former foreign students. In the tech fields, the PERM workers are typically former foreign students, but need not be. 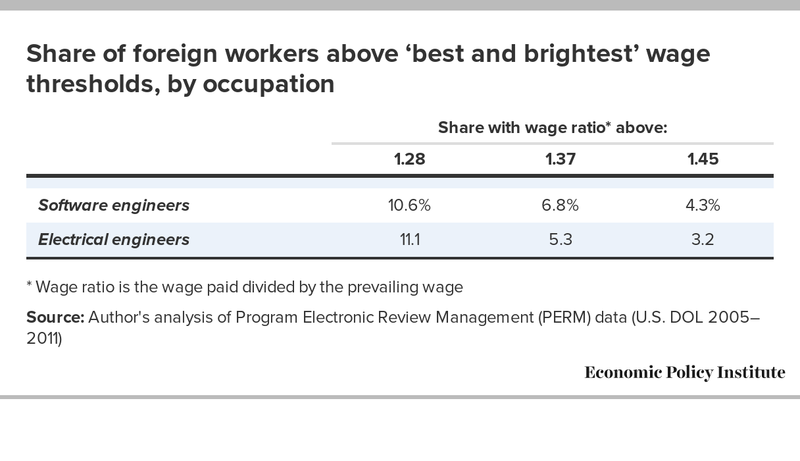 These data are quite valuable for our goal of assessing whether the foreign workers are typically the “best and the brightest.” The legal prevailing wage is the average wage for American workers in a given profession, for a given region and a given number of years of experience. As such, it allows us to automatically control for these variables in assessing talent level. If the workers are of outstanding talent, their salaries should be much higher than average, so we have a direct measure of talent relative to the general population of workers in the given field, precisely our goal. In other words, we are interested in workers with high values of what this report will refer to as the “wage ratio” (WR), the quotient of the wage paid to the prevailing wage. Computing WR should in principle be ideal for our purposes of identifying the prevalence of best/brightest workers. But we must address the prevailing wage issue. As noted, there are indications that the legally required prevailing wage is often below true market levels, thus enabling underpayment of H-1B workers. As previous work has shown, one may attempt to adjust for this (Matloff 2006). However, in the interest of simplicity, the approach in this analysis draws on the matter from the point of view of industry claims. The tech industry asserts both that its foreign workers are fairly paid and that those workers are typically “the best and the brightest.” The research approach here is to examine whether the data are consistent with the second claim, under the assumption that the first one is valid. New Stanford CS graduates earn 37 percent more than average CS graduates (Stanford 2010). At 20 years after graduation, general Stanford graduates earn 28 percent more than graduates of nearby San Jose State University (Krieger 2010). General graduates of the most selective schools have starting salaries 45 percent higher than graduates of the least selective schools (Carnevale and Strohl 2010). These numbers correspond to WR values of 1.37, 1.28, and 1.45. To put them in perspective, consider the 75th percentile of wages for the occupation category “software developer, applications,” in the Occupational Employment Statistics database.11 The ratio of 75th percentile wage to median wage in 2011 was $111,990 / $89,280 = 1.25. Thus, a WR value of 1.28 is at roughly the 75th percentile. In other words, a WR of 1.28 is arguably a conservative criterion for best and brightest, indicating a good worker but not the “game changer” and “genius” workers described earlier in this report. Table 2 presents the share of foreign workers who satisfy these wage criteria. It calculates the proportion of foreign workers in software and electrical engineering whose wage ratios are above the given thresholds. The PERM data show that the vast majority of foreign workers do not even meet the modest 1.28 threshold for best and brightest, let alone the more stringent definitions. Recall that this dataset consists of workers at mainstream U.S. firms, not Indian outsourcing companies. It is instructive to look at specific firms. Table 3 presents the distribution of foreign workers’ wage ratios at the largest tech users of the green card system. It shows that in some firms there are more foreign workers above the various thresholds to qualify for best and brightest than for the labor market as a whole, as shown in Table 2. 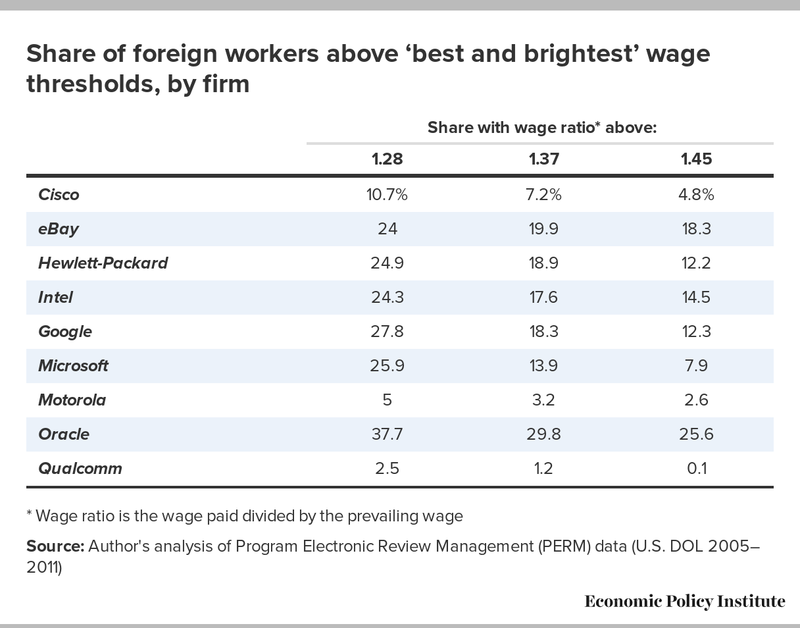 However, for every firm listed in Table 3, the solid majority of their foreign software and electrical engineers do not meet even the mildest of the three thresholds for best/brightest, 1.28, or roughly the 75th percentile of wages in the general market. Bill Gates has stated that Microsoft pays its foreign workers “$100,000 a year to start” (Broder 2006). Bill Kamela of the Microsoft Policy Council has made a similar claim regarding Microsoft starting salaries for software engineers (Kamela 2012). Yet these claims are not confirmed at all by the PERM data. The data show that only 21 percent of the workers Microsoft sponsored for green cards during 2006–2011 had salaries of at least $100,000. In fact, only 18 percent of Microsoft’s sponsored workers with software engineering titles were above the $100,000 mark. If salary level is indicative of the best and the brightest, as Gates and Kamela suggest, only a minority of Microsoft’s foreign hires would qualify. By contrast, 34 percent of Microsoft’s green card sponsorees with financial analyst titles made over $100,000, as did 71 percent of its lawyers in the PERM data. It would seem that, counter to its rhetoric, engineers are not top priority for Microsoft, a point to be discussed again later in this report. Finding that Asian immigrants lagged behind comparable Europeans in salary, Hunt (2011) speculated that the cause was poor English skills among the Asians. This raises the question of whether the modest WR values seen above are artificially low, due to language. However, Hunt’s speculation does not seem to be borne out in the case of CS/EE. The tech industry is famously meritocratic for nonmanagement engineering workers. Since workers produce tangible products of direct, crucial value to the firms, all that matters to their employer is whether they successfully wrote the code or designed the chips; if they did, they are rewarded, even if their grammar is flawed. Professor Joyce Tang found that language skills were not a barrier to Asian immigrant engineers relative to the Caucasian immigrants, even for those who wished to obtain academic positions (Tang 2000). A logistic regression analysis performed by the author on the Census’s 2000 Public Use Microdata Sample (PUMS) (not presented here) shows that, among immigrant Chinese engineers and programmers, English skill had no statistically significant impact on the probability of earning a high salary, defined to be above $150,000. The previous sections analyzed wages, presuming that the top innovators in a firm would also get top wages. This and some succeeding sections more directly address the innovation and quality issues. In this section, we examine awards for top Ph.D. dissertations. Such an analysis examines only a small sliver of graduate accomplishments but nevertheless provides some useful information. The dissertation awards data enable a direct examination of the innovative talent of foreign students.13 By comparing the percentage of foreign students among the awardees to the percentage of foreign students among all doctorates earned in computer science, we can assess whether foreign students disproportionately win the award. The NSCG data show that 51 percent of the computer science Ph.D.s in the United States as of 2003 had originally entered the United States as foreign students. The Computing Research Association’s annual Taulbee Survey shows that, of the CS Ph.D.s granted between 1994 and 2007 (mainly in the United States, but including Canada as well), 48 percent went to international students. During the period 1985–2009, 29 dissertation awards were given to students at North American universities (28 in the United States, one in Canada). Of these, 14 went to foreign students. This fraction, 0.48, has a margin of error of 0.19, and is not statistically different from the figures of 0.51 and 0.48 stated above for the proportion for former foreign students among CS Ph.D.s. Thus, foreign students earned the dissertation award roughly in proportion to their presence in the doctoral student population, again indicating that the foreign students are similar to, rather than more talented than, their American classmates. With this in mind, we performed a similar, more thorough analysis for computer science students for this report. In a 2010 study, the National Research Council assessed the quality of Ph.D. programs in most major fields and at most major universities (NRC 2010). This survey includes data on the percentage of international students in a given program at a given school, a figure which allows an assessment of the quality of schools attended by foreign students. Though the NRC rated each program, its method was imputational—it developed a statistical formula to serve as a proxy for reputation—and its ratings sparked controversy (Aaronson 2010). This report uses the U.S. News and World Report ratings of computer science Ph.D. programs, which “are based solely on the results of surveys sent to academics….” (Morse 2012). USNWR assigns ratings from 1.0 to 5.0, but did not publish those falling below 2.0. (The data used cover the top 128 schools.) The data are for the period 2001–2006. Table 4 presents tabulations of the NRC data on the quality of schools attended by foreign computer science students. 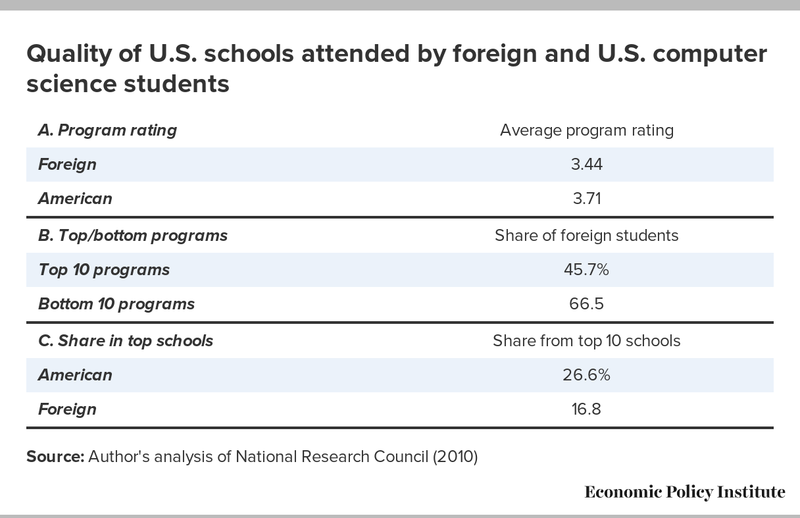 Panel A shows the mean program quality ratings for the foreign and American students. The results suggest that Americans attend more selective, higher-quality universities than do foreign students when earning Ph.D.s in computer science. Panel B in Table 4 provides data on the share of foreign students among the 10 strongest and weakest university programs. These figures are consistent with the Bound study, i.e., there are higher percentages of foreign students in the weaker computer science programs. Panel C of Table 4 shows the percentages of American and foreign students who come from the top-10 CS programs. Americans are more likely to earn their computer science Ph.D.s in a top school than are foreign students (26.6 percent of American students vs. 16.8 percent of foreign students). Nevertheless, a program’s ranking is a fairly good measure of the average quality of the students from that program. Thus, the data above indicate that the foreign students generally are not more talented or better educated than the Americans; on the contrary, the foreign computer science Ph.D. students attend weaker-than-average programs. It would be of interest to perform similar analyses at the master’s degree level. Unfortunately, there do not seem to be such data available, tabulated by school and field. Anecdotally though, it appears that enrollments in CS master’s programs at the non-Ph.D. granting schools are even more heavily weighted toward foreign students than at the Ph.D. level. In the case of California State University, East Bay,16 for example, 90 percent of the CS master’s students are international (Jaschik 2012). None of these studies addresses the central question relevant here, which is whether the foreign worker programs are raising our average level of tech talent. Are the immigrant tech workers more prone to patenting on a per capita basis, after education and other variables are taken into account? If the United States is indeed facing an internal brain drain, the critical question is: Are the immigrants of higher quality than those they are displacing? Hunt’s second study (Hunt 2009 is the working paper version; Hunt 2011 the final) addressed this question. In the working paper, she wrote, “After I control for field of study…and education…both main work visa groups and student/trainee visa holders have statistically significantly lower patenting probabilities than natives.” In the final published version the dataset coverage was somewhat different, but she still found no statistically significant difference between immigrants and natives. As mentioned, though, Hunt cast a broad net in her work, encompassing myriad fields and types of entry visas, in contrast to the narrower focus of the research presented here on former foreign students in computer science and electrical engineering. Let us turn again to analysis of CS/EE in the NSCG data. Unlike the earlier analysis, we no longer restrict the sample to U.S. citizens and permanent residents. The sample does exclude those in academia and government, where patenting rates are lower. Table 5 presents regression analyses of patent applications, overall and commercialized, for computer science (columns 1 and 2) and electrical engineering (columns 3 and 4). In each case there are controls for level of education (dummy variables for either master’s degree or Ph.D.) and age, and whether the worker is a former foreign student (original F-1 status). * Indicates statistically significant at the 5 percent level. In column 1, the coefficient for computer science workers who were former foreign students, -0.439, is significantly different from zero at the 5 percent level. In other words, among computer science workers, on average, the former foreign students are producing about half a patent application fewer per person than are Americans of the same age and education level. On the other hand, in electrical engineering (column 3), the former foreign students’ patenting activity is not significantly different from the Americans. The NSCG data also tally commercialized patents, so Table 5 presents analyses of the propensity to procure commercialized patents by computer science (column 2) and electrical engineering (column 4) workers. The results are similar to those for all patents. Former foreign students in computer science produce 0.118 fewer commercialized patents than their American counterparts of the same age and education level. On the other hand, former foreign students in electrical engineering produce a comparable number of commercialized patents to their American counterparts. 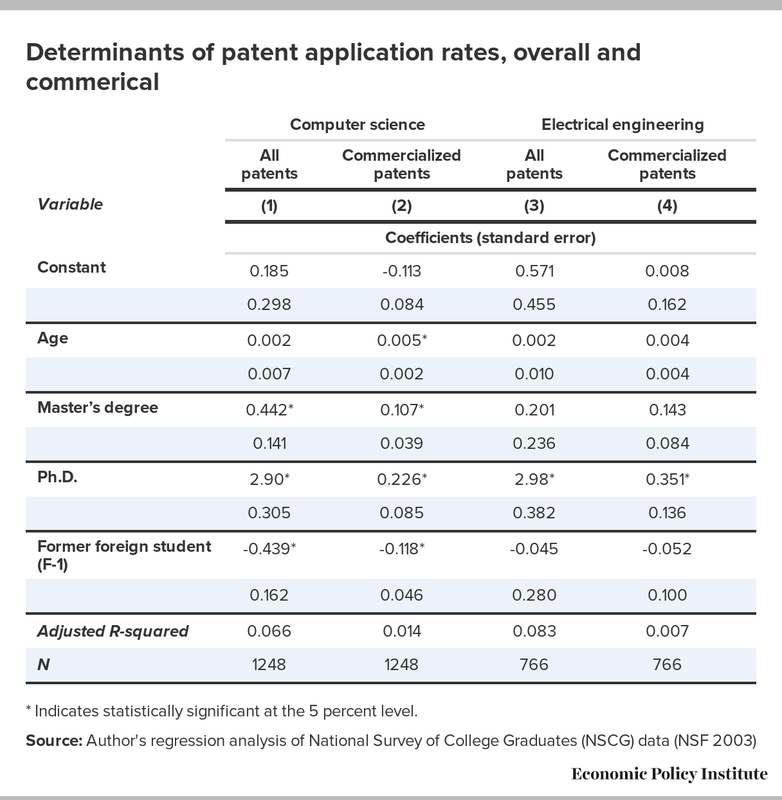 In summary, the former computer science students apply for somewhat fewer patents than do their American peers, and also are awarded fewer patents that are eventually commercialized. In the case of electrical engineering, the foreign and American groups have the same mean numbers of patent applications, both general and commercialized. Again, the data do not show a best and brightest tendency among the former foreign students. Presumably much (though by no means all) of the innovation in the tech industry comes from those working in research and development positions. It is thus of interest to investigate the proportions of U.S. versus immigrant workers who hold such jobs. Fortunately, the NSCG data include a variable for this status. Since the outcome is binary (you either work in R&D or you do not), a logistic (“logit”) regression model was used rather than a linear one. A logit regression still forms a weighted sum of the predictor variables as in linear regression, but it models a probability instead of a general mean, in this case the probability of working in R&D. The results of the logit model for both computer science and electrical engineering, looking at the probability of working in R&D while controlling for age (and the square of age18) and education level, are presented in Table 6. The estimated coefficients from a logit regression are interpreted as the rate of change in the “log odds” of (in our case) working in R&D, as the independent variables change. As is common practice in discussions of logit regression results, here we discuss the more intuitive “marginal effect” of being a foreign former student for specific values of the other independent variables. The data indicate that in both computer science and electrical engineering, the foreign former students are significantly less likely to work in R&D, compared to Americans of the same age and educational background. For example, consider 30-year-old workers with master’s degrees. In computer science, substitution into the logit formula shows that the Americans are about 10 percent more likely to be working in R&D than are comparable foreign former students (a 0.89 probability versus 0.81). 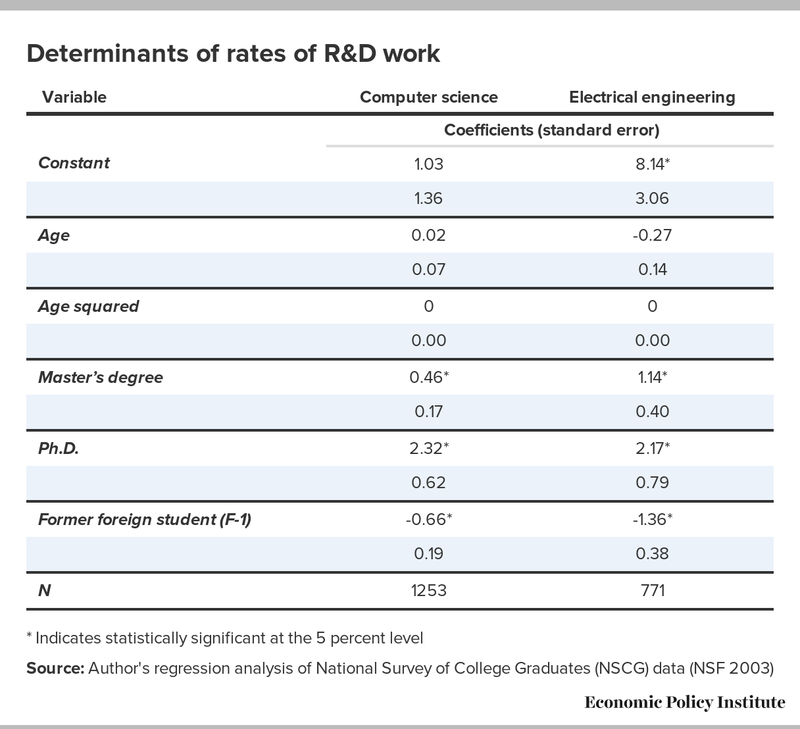 In electrical engineering, the difference is dramatic—the Americans are 68 percent more likely to be in R&D than the foreign former students, with the probability of R&D work being 0.76 for the Americans but only 0.46 for the foreign former students. These are interesting results. One might take the view that considering patents or dissertation awards is setting the bar too high: A worker might be quite innovative without necessarily having the work patented, and the bar for the dissertation awards is extremely high. These latter findings, however, address the industry’s core source of innovative work, its R&D units, and the data show that these units are staffed disproportionately by Americans rather than by foreign former students. The immigrant workers, especially those who first came to the United States as foreign students, are in general of no higher talent than the Americans, as measured by salary, patent filings, dissertation awards, and quality of academic program. In the computer science case, the former foreign students are in fact generally of significantly lower talent in many aspects than Americans of the same age, education, and so on. The immigrant workers who first came to the United States as foreign students are significantly less likely than Americans to be working in R&D, the industry’s main source of innovation. This is true for both computer science and electrical engineering. Is there a tech labor shortage? If the foreign workers are not being hired generally because they are the best and the brightest, are they being used to remedy labor shortages? The topic is addressed in this section. More recent data also counterindicates shortage claims. The National Association of Colleges and Employers (NACE) tracks salaries of new graduates. NACE reports that computer science starting salaries just kept pace with inflation from 2010 to 2011, with a 1 percent increase (NACE 2011). Though electrical engineering was an exception, with a 4.4 percent advance (after a dip of 1.2 percent the previous year), overall engineering starting salaries essentially stayed flat since 2010, with a 0.3 percent increase. And the 2010 salary levels were actually 0.5 percent lower than in 2009 (NACE 2011). A term currently popular in STEM policymaker circles is diversion, referring to workers with a bachelor’s degree or higher in STEM but who work in non-STEM fields (Bernstein, Lowell, and Martin 2011; Carnevale, Smith, and Melton 2011). Though this is a recognition of the fact that there is indeed an internal brain drain occurring in STEM, it does not address the questions of why this is occurring. The issue is addressed in this section, and the nexus of this internal brain drain with the H-1B and other foreign worker programs will be shown. On July 7, 2012, the Washington Post (Vastag 2012) reported on a major study by a high-level committee in the National Institutes of Health (NIH). The main findings were that the vast majority of those with doctorates in the life sciences are never able to secure a research job in the field, even after years of low-paid postdoctoral research work. The article illustrated the point with personal cases, such as a woman with a doctorate in neuroscience now working as an administrative assistant. Readers who followed up by watching the video presentation of the NIH report (NIH 2012) may have been startled to find that the H-1B visa is part of the oversupply problem; the video mentioned the role of foreign researchers in the United States at several points. Approximately 54 percent of postdoctoral researchers are foreign, most of them on H-1B visas (Davis 2006). The NIH committee also stated that the resulting huge labor surplus, and the ensuing low wages and poor career prospects, are driving many of the nation’s best and brightest out of the field. It is not clear whether the PRA report represented official NSF policy. However, the report did correctly project that the H-1B and related programs would drive American students away from doctoral study, i.e., would cause an internal brain drain in STEM. Significantly, the PRA accurately forecast that the STEM wage suppression would cause American students to shift to business and law. As seen earlier, the PERM data show that Microsoft pays its financial analysts and lawyers much more than it pays its engineers. Former Federal Reserve chairman Alan Greenspan has made a number of public statements advocating the importation of foreign tech workers as a means of holding down salaries (Thibodeau 2009). (Greenspan referred to tech workers as a “privileged elite,” apparently not placing the much higher-paid professions in the legal field and on Wall Street in that category.) The congressionally commissioned National Research Council study also concluded that H-1B adversely impacts tech wages (NRC 2001, 187). Note that diversion cannot be viewed as a failure of the American K-12 educational system, as is often claimed. True, some students are weak in STEM or are disinterested in it, but the points made above apply to students who are skilled at STEM, and who do specialize in STEM in college. As remarked above, the issue of diversion concerns workers who have bachelor’s degrees in STEM but who, either immediately after attaining their degrees or later on, are working outside of STEM. Indeed, in the NIH study discussed above, the workers have doctorates in STEM, plus years of postdoctoral work. As noted, the NIH fretted that the H-1B visa is resulting in loss of career to many Americans in lab science. In addition, the stagnant salaries caused by the foreign influx discourage young people from pursuing a career in STEM. Young people see these market signals and respond accordingly. Even many Indian immigrant engineers’ children see the tech field as unstable, subject to outsourcing to India (Grimes 2005). The talents STEM students have been applying—keen quantitative insight, good problem-solving and analytical skills, and so on—are much more highly rewarded outside STEM, as exemplified by the Microsoft salary analysis above. Georgetown University researcher Anthony Carnevale has remarked, “If you’re a high math student in America, from a purely economic point of view, it’s crazy to go into STEM” (Light and Silverman 2011). In his paper, Freeman argues that fewer American-born workers pursue science and engineering not only because they have more career choices than foreign workers, but also because some choices offer better wages. Average annual salaries for lawyers, for example, amounted to more than $20,000 above those for doctoral-level engineers and $50,000 more than those for life scientists with doctorates, according to Census data that Freeman cites in the paper…. U.S. companies, he added in an interview, have been quite willing to encourage a foreign supply of technical workers. This has allowed them to pay lower wages, but it has also created conditions that make science and engineering less attractive to Americans. This internal brain drain might have been justified if the foreign workers were of higher caliber than the Americans, but, as shown earlier, this is not the case. The consistent theme in the results here has been that the immigrant engineers and programmers who first come to the United States on student visas—the group the industry lobbyists claim are most talented—are quite similar to the Americans in talent, or are of lesser talent than the Americans, contrary to the “genius” image projected by the industry. A little-discussed but vital aspect of the current green card sponsorship process is that it effectively ties the foreign worker to the employer for a number of years. This condition allows for the legal exploitation of foreign workers but also has negative consequences for American workers, since they become less attractive to employers than the exploitable foreign workers. That immobility is extremely valuable to the employer in the sense of preventing worker losses during projects, and it can tie in to the wage issue as well. FACEIntel, an Intel dissident worker group, has reported that an Intel human resources representative “…told staff of the Microprocessor Technology (MT) group, ‘…after hiring the foreign student, delay the immigration paper work process, because once they get their green cards we lose them to companies like Sun Microsystems and Silicon Graphics, they pay them about 30 percent more’” (FACEIntel 1996). The point relevant here is that this indenture, in Swaim’s words, is “the most important advantage” to employers of green card sponsorship, and puts American job applicants at a substantial disadvantage. The employer has a big incentive to hire a foreign worker in lieu of a similarly qualified American. H-1B also has a major impact on “older” workers—which in the realm of H-1B and the tech field can mean anyone over age 35. Employers prefer to hire younger, thus cheaper, H-1Bs instead of older, thus more expensive, Americans. The NSCG data show a wide difference in ages, with a mode of age 29 for the H-1Bs in CS/EE versus 42 for the Americans. The tech industry’s hiring focus on the young has been well documented (NRC 2001; Brown, Campbell, and Pinsonneault 1998; Brown and Linden 2009). Microsoft admits that “the vast majority of Microsoft hires are young, but that is because older workers tend to go into more senior jobs and there are fewer of those positions to begin with” (Wadhwa 2008; emphasis added). In summary, the foreign worker programs are causing an internal brain drain in the United States, in which the nation’s own best and brightest are either displaced or discouraged from entering the tech field in the first place. Axiom I: The immigration to the United States of the world’s genuinely best and brightest in science, technology, engineering, and math (STEM) should be encouraged and facilitated. Axiom II: U.S. immigration policies should not discourage America’s own most talented young people from pursuing a STEM career. The discussion above on the internal brain drain, particularly the statements by analysts at the premier government science agencies NIH and NSF, demonstrates that current immigration policy is antithetical to Axiom II. The present policy is causing an internal brain drain from STEM careers. Furthermore, the findings and remarks coming out of NIH and NSF imply that what should not be done is grant automatic green cards to foreign STEM students studying at U.S. universities, as has been proposed. Flooding the labor market would worsen the problems, not solve them. If we accept the NSF internal report’s point, cited in the last section, that bringing in more foreign students would drive away American students, then its support for an automatic green card program is counter to Axiom II, i.e., it would discourage U.S. students from pursuing STEM. This is a strong argument against the current green card proposals. As discussed earlier, foreign worker programs allow employers to avoid hiring older Americans. Proposed legislation granting automatic green cards to new foreign graduates would have the same adverse impact as the H-1B program currently does, since the beneficiaries would mostly be young. Again, this possibility argues against automatic green card proposals. And in light of the tech industry’s (debunked) claim that the reason it does not hire older workers is that the rapidly evolving technology has passed them by, what would be the point of granting automatic green cards to foreign STEM students? In a few years, the technology will have passed them by too. They will have permanent residency but obsolete skills. Thus, proposals for automatic granting of green cards to STEM foreign students would be unwarranted and indeed harmful. What, then, is the proper way to accomplish the goals in Axioms I and II? Consider first Axiom I. How can we facilitate the immigration of individuals who are genuinely the best and brightest? The employment-based green card quotas should be rebalanced to provide a greater share of the visas to the categories that the current statute gives to “the best and the brightest,” i.e., the first employment-based green card category (EB-1, for “foreign nationals of extraordinary ability” and “outstanding professors”), as well as the second (EB-2, for those with “exceptional ability” or “[possessing] an advanced degree”). EB-1 visas are processed relatively quickly, with no wait for a quota slot in most years, but some of the quota in the third category (EB-3, for those “[possessing] a bachelor’s degree”) should be shifted to EB-2. The wage ratio (WR) analysis in this report suggests an alternative to the automatic green card proposals, one directly targeted to bringing in outstanding talents, the industry’s professed goal. Instead of granting automatic green cards to a broad class of foreign STEM students, such a program could be limited to any worker having a legitimate job offer with a WR value above a certain threshold in STEM occupations. The 90th percentile corresponds to a WR value of about 1.53 for software engineers, for example, so this might serve as a starting point for the discussion. The existing O-1 temporary work visa22 and the National Interest Waiver in the EB-2 green card category are both aimed at the best/brightest group, but some argue that the criteria in these visas are too stringent. This might be revisited. Concerning Axiom II, we need to assure that programs like H-1B are used only to attract the best and the brightest or to remedy genuine labor shortages—not to serve as a source of cheap, compliant labor. The employer incentives for using foreign workers as cheap labor must be removed, and the practice of using green card sponsorship to render the foreign workers captive must be discontinued. The first task in removing the cheap-labor incentive is to reform the legal definition of prevailing wage, which is riddled with loopholes that permit the underpayment of H-1B workers relative to their true market value. The redefinition of prevailing wage in the H-1B reform legislation introduced by Senators Richard Durbin (D-Ill.) and Charles Grassley (R-Iowa) defines the prevailing wage as the median wage in the occupation and local area—without breaking the wage down by experience level. This would be a major step forward. Also, currently the statute defines the prevailing wage in terms of the job, not the worker. This enables an employer to, for example, hire a foreign worker with a master’s degree at the price of a bachelor’s degree holder. This must be fixed too, perhaps by setting a separate prevailing wage scale for holders of postgraduate degrees. Otherwise, the value of a master’s degree for U.S. workers will be diminished, exacerbating the internal brain drain. Regarding green card sponsorship, again the definition of prevailing wage must be reformed, in the manner discussed for the H-1B visa above. And our goal is, clearly, not to find a qualified and interested U.S. worker. And you know in a sense that sounds funny, but it’s what we’re trying to do here. We are complying with the law fully, but our objective is to get this person a green card…. Cohen and Grigsby is not a rogue business; it is one of the most prominent law firms in the Pittsburgh area, and often quoted in the press. The partner who made the remark is an adjunct professor at the University of Pittsburgh. In other words, the firm’s behavior here is standard practice in the field, and was in fact defended by the American Immigration Lawyers Association spokesperson (Sostek 2007). Joel Stewart, one of the nation’s most prominent immigration lawyers, has said, “Employers who favor aliens have an arsenal of legal means to reject all U.S. workers who apply” (Stewart 2000). Abuse of foreign worker programs is thoroughly mainstream, both in terms of employers and in terms of the prestigious immigration law firms involved.23 Focusing exclusively on Indian outsourcing firms while ignoring the mainstream firms that abuse the visa program would be unwarranted scapegoating. And imposing special restrictions on Indian firms’ use of H-1B visas should not be allowed to serve as cover for failing to tackle the broader problems in the H-1B visa program. —Dr. Norman Matloff is a professor of computer science at the University of California, Davis. His commentary and analyses of high-skilled immigration issues have appeared in various academic journals and media outlets, and he has written extensively on the subject. Dr. Matloff received his Ph.D. in mathematics from the University of California, Los Angeles. 1. This is seen in the annual Report on Characteristics of Specialty Occupation Workers (H-1B) from the U.S. Customs and Immigration Service (USCIS). For fiscal year 2001, for instance, CS had 52.1 percent of the total, and the next-largest category, EE, had 4.7 percent. 2. These firms, colloquially referred to as “bodyshops,” rent programmers, almost all of whom are foreign workers, to other U.S. firms. 3. The author performed an analysis on research paper counts and found no difference between the immigrant and U.S. tech workers, but it is not presented here. 4. The publication Hunt (2009) is a working paper, and its analysis included those currently on a work visa. This group was not included in the final published paper, Hunt (2011). 5. Unfortunately, the dataset does not have a finer description of region. The hiCOL variable does not include the major high-tech area of Chicago, for example. This results in some residual overstatement of the wages of the former foreign students. 6. Many labor analyses regress the logarithm of wage, rather than the wage itself. However, this produces distortion if the original relationship was not exponential. 7. The adjusted R-squared value is similar to the familiar R-squared fit measure, but modified to account for possible overfitting. 8. The PERM data should not be confused with the Labor Condition Application (LCA) data associated with the H-1B visa. An LCA record does not necessarily correspond to an actual worker. 9. Data are also available for the period 2000–2004. However, a rule change occurred starting with the 2005 data (previously it was permissible to pay as much as 5 percent below prevailing wage), so the analysis here is restricted to that period. Another point to mention is that beginning in 2005, employers have had the option of stating offered salary as a range rather than an exact figure. Records with salary ranges are excluded here, thus eliminating around 10 percent of the records each year. WR, the statistic computed here, appears not to have been affected by this exclusion, as evidenced by comparing pre- and post-2005 medians. 10. For the year 2005, for example, 91 percent of the applications based their prevailing wage values on the OES database compiled by the Bureau of Labor Statistics. In some cases the employer uses a private survey, yielding a level preferable to the employer (i.e., a lower level). 11. The government figures for prevailing wage are based on the OES data. The numbers cited here are from http://www.bls.gov/oes/current/oes1511232.htm. 12. Hunt herself, in a more recent paper that investigates the language issue more directly, also finds that language has little impact on nonmanagement tech workers (Hunt 2012). 13. Information gleaned from the Web, such as CVs, biographies, and so on, was used to determine whether the awardees were international students. If for instance a student had done undergraduate work abroad, then he was counted as a foreign student at the time he won the Ph.D. award at a U.S. school. 14. The students started coming to the United States after China opened in 1979. The numbers were small at first, but as a CS professor handling graduate admissions at the time, I found that the influx was strong by the mid-1980s, jibing with the Orleans figure. 15. Many of the top CS programs bring in large amounts of research grant funding, and thus need large numbers of research assistants. Anecdotally, I have found that this pressing need sometimes results in some compromise to admissions standards. 16. CSUEB, formerly California State University at Hayward, is a member of the 23-campus, public CSU system. 17. Some of these studies also find an association between H-1B and American patenting. 18. The squared term was included on the assumption that the propensity of working in R&D may first rise then later fall with age. 19. Carnevale, Smith, and Melton (2011) claims a shortage, citing “rising wages,” but supplies no data to the support the assertion. 20. See also Freeman (2006). 21. Back in 1998 Congress, accepting the industry’s claim that older tech workers’ employment difficulties are due to lack of newer skills, added a user fee that employers of H-1Bs must pay into a retraining fund. This failed to reduce H-1B usage (Vaas 2000), not surprising in light of the Wadhwa remark above—even if the skills issue were not a pretext, in the end a retrained expensive older programmer would still be an expensive older programmer. See Matloff (2003 and 2006) for more details on the age and skills issues. 22. The O-1 visa is for “individuals who possess extraordinary ability in the sciences, arts, education, business, or athletics, or who have a demonstrated record of extraordinary achievement in the motion picture or television industry and have been recognized nationally or internationally for those achievements.” See “O-1 Visa: Individuals With Extraordinary Ability or Achievement,” USCIS, available at http://www.uscis.gov/portal/site/uscis/menuitem.eb1d4c2a3e5b9ac89243c6a7543f6d1a/?vgnextoid=b9930b89284a3210VgnVCM100000b92ca60aRCRD&vgnextchannel=b9930b89284a3210VgnVCM100000b92ca60aRCRD. 23. See Matloff (2012) for data on the rates that Cisco, Intel, Microsoft, and other mainstream firms made use of a certain loophole in the prevailing wage law. Aaronson, Scott. 2010. “NRC: Nonsensical Ranking Clowns.” Technology Review (Massachusetts Institute of Technology), September 30. Barlas, Demir. 2008. “H-1B Season Is Here.” IT Knowledge Exchange Blog, March 5. Barrett, Craig. 2007. “A Talent Contest We’re Losing.” Washington Post, December 23. Bernstein, Hamutal, Lindsay Lowell, and Phillip Martin. 2011. Conference Report: Dynamics of the STEM Labor Market. Washington, D.C.: Georgetown University. Bound, John, Sarah Turner, and Patrick Walsh. 2009. “Internationalization of U.S. Doctorate Education.” In R. Freeman and D. Goroff, eds., The Science and Engineering Workforce in the United States. Chicago, Ill.: National Bureau of Economic Research/University of Chicago Press. Broder, David. 2006. “For Gates a Visa Charge,” Washington Post, March 19. Brown, Clair, Ben Campbell, and Greg Pinsonneault. 1998. The Perceived Shortage of High-Tech Workers. Working paper. University of California, Berkeley. Brown, Clair and Greg Linden. 2009. Chips and Change: How Crisis Reshapes the Semiconductor Industry. Cambridge, Mass. : MIT Press, p. 132. Cha, Ariana Eunjung. 2010. “Indian Government Calls H-1B Visa Fee Hike ‘Discriminatory’.” Washington Post, August 10. Davis, G. 2009. “Improving the Postdoctoral Experience: An Empirical Approach.” In R. Freeman and D. Goroff, eds., The Science and Engineering Workforce in the United States. Chicago, Ill.: National Bureau of Economic Research/University of Chicago Press. DeMarco, Tom and Timothy Lister. 1987. Peopleware: Productive Projects and Teams. New York, N.Y.: Dorset House Publishing. Freedman, David, Roger Purves, and Robert Pisani. 1998. Statistics (3rd ed.). New York, N.Y.: W.W. Norton. Freeman, Richard. 2006. “Does Globalization of the Scientific/Engineering Workforce Threaten U.S. Economic Leadership?” In Adam Jaffee, Josh Lerner, and Scott Stern, eds., Immigration Policy and the Economy. Vol. 6. Cambridge, Mass. : MIT Press. Friedman, Thomas. 2009. “Invent, Invent, Invent.” New York Times, June 27. Gavin, Robert. 2005. “US Could Lose High-Tech Edge, Study Says,” Boston Globe, August 8. Greenspan, Alan. 2008. The Age of Turbulence: Adventures in a New World. London, England: Penguin. Grimes, Ann. 2005. “Even Tech Execs Can’t Get Kids To Be Engineers.” Wall Street Journal, March 29. Hamermesh, Daniel and Gerard Pfann. 2011. “Reputation and Earnings: The Role of Quality and Quantity in Academe.” Economic Inquiry, Vol. 50, No. 1, January. Hoffman, Craig. 2007. “Does Silicon Valley Need More Visas for Foreigners?” Wall Street Journal, March 19. Hunt, Jennifer. 2009. “Which Immigrants Are Most Innovative and Entrepreneurial?” Working Paper #14920. Cambridge, Mass. : National Bureau of Economic Research. Hunt, Jennifer. 2011. “Which Immigrants Are Most Innovative and Entrepreneurial?” Journal of Labor Economics, Vol. 29, No. 3, pp. 417–457. Hunt, Jennifer. 2012. “Does the United States Admit the Best and Brightest Computer and Engineering Workers?” Working Paper. New Brunswick, N.J.: Rutgers University. Hunt, Jennifer and Marjolaine Gauthier-Loiselle. 2010. “How Much Does Immigration Boost Innovation?” American Economic Journal: Macroeconomics, April. Jaschik, Scott. 2012. “One Cal State Department Refuses to Let in Out-of-Staters Over State Residents.” Inside Higher Ed, August 13. Kaye, David and David Freedman. 2000. “Reference Guide on Statistics.” In Manual on Scientific Evidence (2nd ed.). Washington, D.C.: Federal Judiciary Center. Kerr, William and William Lincoln. 2010. “The Supply Side of Innovation: H-1B and Ethnic Innovation.” Journal of Labor Economics, Vol. 28, No. 3. Krieger, Lisa. 2010. “California State University Puts Price on Education.” San Jose Mercury News, November 14. Lehrer, B. 2009. Radio interview of Vivek Wadhwa, Brian Lehrer Show, WNYC, May 1. Light, Joe and Rachel Silverman. 2011. “Generation Jobless: Students Pick Easier Majors Despite Less Pay.” Wall Street Journal, November 9. Lutz, Prechelt. 1999. “Comparing Java vs. C/C++ Efficiency Differences to Interpersonal Differences.” Communications of the ACM, Vol. 42, No. 10, October. Matloff, Norm. 2003. “On the Need for Reform of the H-1B Work Visa.” University of Michigan Journal of Law Reform, Fall. Matloff, Norm. 2006. “The Adverse Impact of Work Visa Programs on Older U.S. Engineers and Programmers.” California Labor and Employment Review (California State Bar Association), August. Matloff, Norm. 2008. Still Not the Best and the Brightest. Washington, D.C.: Center for Immigration Studies. Matloff, Norm. 2012. “H-1B Visas.” In J. Gans, E. Replogle, and D. Tichenor, eds., Debates on U.S. Immigration, Washington, D.C.: Sage Publications. McCullagh, Declan and Lakshmi Chaudhry. 1999. “Congress Debates Tech Visas.” Wired Magazine, August 6. Mithas, S. and H. Lucas. 2010. “Are Foreign IT Workers Cheaper? United States’ Visa Policies and Compensation of Information Technology Professionals.” Management Science, May. NAFSA: Association of International Educators. 2007. “Position Statement on Comprehensive Immigration Reform.” New York, N.Y.: NAFSA, May 24. National Association of Colleges and Employers (NACE). 2011. “Press Release: Average Starting Salary to Class of 2011 Up 3.5 Percent,” February 10. National Research Council (NRC). 2001. Building a Workforce for the Information Economy. Washington, D.C.: National Academies Press. National Research Council (NRC). 2010. Assessment of Research Doctorate Programs. Washington, D.C.: National Academies Press. National Science Foundation (NSF). 2003. National Survey of College Graduates (NSCG). Arlington, Va.: NSF. Ong, Paul and Evelyn Blumenthal. 1997. “Scientists and Engineers.” In D. Hamamoto and R. Torres, eds., New American Destinies: A Reader in Contemporary Asian and Latino Immigration. New York, N.Y.: Psychology Press. Orleans, Leo. 1988. Chinese Students in America: Policies, Issues, and Numbers. Washington, D.C.: National Academies Press. Patterson, David, Lawrence Snyder, and Jeffry Ullman. 1999. Evaluating Computer Scientists and Engineers for Promotion and Tenure. Washington, D.C.: Computing Research Association. Salzman, Hal and B. Lindsay Lowell. 2007. In the Eye of the Storm: Assessing the Evidence on Science and Engineering Education, Quality, and Workforce Demand. Washington, D.C.: Urban Institute. Samson, Ted. 2012. “Demand for Software Engineers Keeps Climbing—and So Do the Salaries.” Infoworld, October 18. Saxenian, AnnaLee. 1999. Silicon Valley’s New Immigrant Entrepreneurs. San Francisco: Public Policy Institute of California. Schramm, Carl. 2011. “Is the Financial Sector Gobbling Up the U.S.’ Would-Be Entrepreneurs?” Forbes, April 13. Sostek, Anya. 2007. “City Law Firm’s Immigration Video Sparks an Internet Firestorm.” Pittsburgh Post-Gazette, June 22. Stanford University. 2010. Salary Statistics, 2009–2010. Stanford, Calif.: Stanford University Career Development Center. Stewart, Joel. 2000. “Legal Rejection of U.S. Workers.” Immigration Daily, April 24. Swaim, David. 2012a. Tidwell, Swaim and Associates. www.tsalaw.com/DavidSwaimEmployment.htm (last visited August 10, 2012). Swaim, David. 2012b. “An Employer’s Guide to the Immigration Process.” Tidwell, Swaim and Associates. www.tsalaw.com/Pdf/employerguide.pdf (last visited August 10, 2012). Tang, Joyce. 2000. Doing Engineering: The Career Attainment and Mobility of Caucasian, Black, and Asian-American Engineers. Lanham, Md. : Rowman and Littlefield. Texas Instruments. 2011. Testimony, House Immigration Subcommittee, October 5. Thibodeau, Patrick. 2009. “Greenspan: H-1B Cap Would Make U.S. Workers ‘Privileged Elite’.” Computerworld, April 30. Vaas, Lisa. 2000. “Failing Grades: H-1B Fees Fail to Lessen Reliance on Imported IT Skills.” eWeek, September 18. Vastag, B. 2012. “U.S. Pushes for More Scientists, But the Jobs Aren’t There.” Washington Post, July 7. Wadhwa, Vivek. 2008. “High-Tech Hiring: Youth Matters.” BusinessWeek, January 15. Wadhwa, Vivek, AnnaLee Saxenian, Ben Rissing, and Gary Gereffi. 2007. “America’s New Immigrant Entrepreneurs.” Working Paper. Durham, N.C.: Duke University. Weier, Mary. 2007. “YouTube Video on Avoiding U.S. Job Applicants Angers Programmers.” InformationWeek, June 18. Weinstein, Eric. 1998. How and Why Government, Universities, and Industry Create Domestic Labor Shortages of Scientists and High-Tech Workers. Cambridge, Mass. : National Bureau of Economic Research.